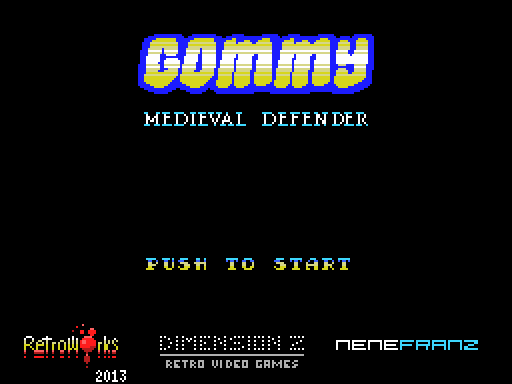 Gommy Medieval Defender fits slick, stripped down and fast gameplay onto 16 kilobytes of cartridge space, and sees the player controlling Gommy, the lone defender of Gommyland castle, as he runs back and forth on the battlements tossing rocks down at the invading foes. Whereas Ork Attack (and I know both games do have a common ancestor on the C64) gave the player an option to summon a sword from a sidekick to fight enemies who had scaled all the way to the top of the walls Gommy doesn't have this luxury - it's rocks to the head or nothing, with enemies successfully scaling the wall meaning instant death. There's a decent difficulty curve and a surprisingly large number of stages for such a tiny game. None of this stopped me failing horribly the first time I ran into a boss fight, as Gommy climbed surprisingly into a cannon and I panicked and just kept hitting the space bar, quickly learning that every time you miss the big boss you lose a life. 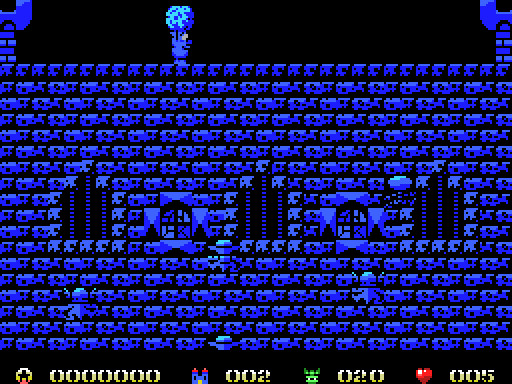 This is a particularly nice touch, a well implemented turnaround from the frantic back and forth of the main levels which calls for a steady hand and good timing. 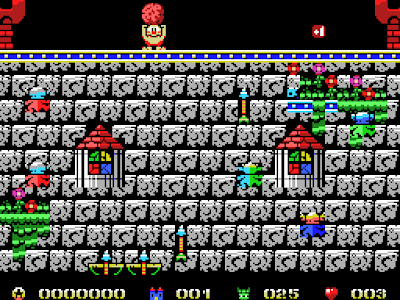 The soundtrack is bouncy and gels well with the pace of gameplay, and in fact created an illusion of the game playing faster with the sound turned up! Either that or playing it in silence made it a more tense, slow paced affair. I've played a few of the MSXDev entries from previous years and while this doesn't feel like a winning game, it certainly holds its head high up among the runners up. It's solidly built, well designed and, most importantly, a lot of block rocking fun. 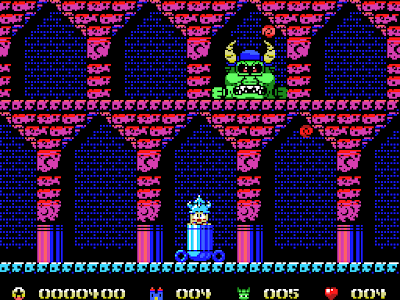 Download the game here (from the MSX.org website). I'm certainly ROCKing my head to the level tune!